Clarkeprint: Printing and design Services. Brochures, booklets, leaflets, business stationery, annual reports, exhibition displays and a lot more. At Clarkeprint we offer a wide range of printed products and related services to fulfill all your business or organisation’s needs. Much of our output is linked to marketing and the maintaining and winning of new business for our clients. We produce high quality print in both litho and digital formats including brochures, presentation folders, newsletters, catalogues, booklets and flyers. Our production capability fulfills both small and large orders and we can offer fast turnaround of specialist items such as annual reports, tender documents and hand books. For many years we have proved to be a reliable supplier of quality volume business stationery, letterheads, compliment slips and business card packages, particularly to the education, financial and legal sectors. As well as delivery of your financial data, an annual report is a great opportunity to showcase your brand. Our in-house design team has some great ideas to deliver a first class result. We are experts at producing booklets in all shapes, sizes and volumes. Our facilities are geared towards fast production of booklets without compromising quality for speed. We don’t underestimate the importance of your business cards; still an essential tool in building relationships between an organisation and its clients or members. We have a great solution to offer which simplifies the whole ordering and production process. Clarkeprint offers a great solution for production of volume business stationery, using premium quality materials to ensure faultless laser printing of your letterheads. We also produce quality compliment slips business cards and envelopes in all the standard sizes, in one or many colours. We are specialists in the production of bespoke calendars. If you want something that is a little different from the run of the mill calendar then we can help. 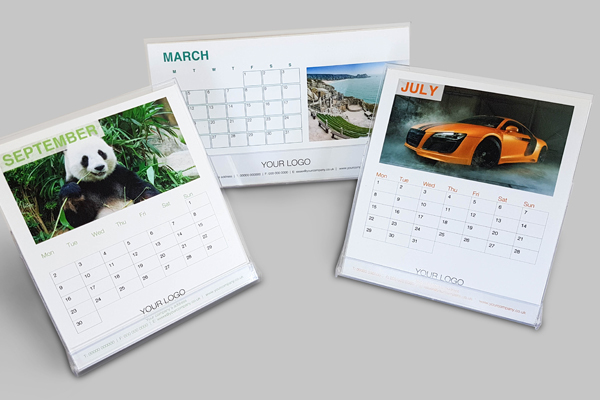 Hanging or desk calendars we can produce in all shapes, sizes and colours. Still a very popular item for many businesses, promoting their wares with a printed catalogue or pricelist is a great way of keeping your brand in front of your customers. Your compliment slips reflects your brand and your business, and our quality compliment slips will create the image your company needs to succeed. Personalised diaries with your own images, logo or text gain huge visual retention. Order your diaries along with the corporate notebooks and stationery to market your business. We are a leading provider of education printing. Our Educational Printing Department specialises in bespoke exercise books, reading records, school prospectuses, diaries and teacher organisers. We supply all manner of labels, self adhesive, kiss-cut sheets or rolls. Any size, shape or colours, just ask for more details. An essential ingredient of any campaign, your leaflets must be both eye catching and functional. We have produced millions of leaflets over the years, printed, trimmed and folded to your specification. No matter what kind of business you're running, a letterhead is just as important as your business cards because it is a powerful tool to brand your company. Our fantastic value for money letterheads will create the image your company needs to succeed. Whether you need a full typesetting, artwork and design service or simply a print provider, we can help. We specialize in short to medium run publications for a wide variety of sectors.